The Department of Astronomy at the University of Illinois hosts a weekly colloquium during the academic year for invited speakers to discuss current research topics in astronomy and astrophysics. 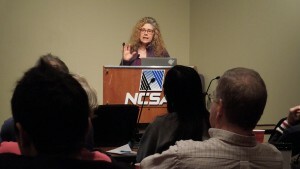 On January 27, 2015 Dr. Donna Cox described projects and lessons learned in the collaborative process of creating astrophysical scientific visualizations for IMAX movies, fulldome digital museum shows, and television documentaries. She spoke on various production challenges and the software used in creating smooth camera paths for high-resolution, large venue projection systems and rendering large data including Blue Waters. Cox also discussed the artistry required to produce visualizations used in public outreach programs. This colloquium included 3D stereo time-evolving movies in NCSA’s 4K3D theater , showing excerpts from productions including “Hubble3D” IMAX movie, California Academy of Science’s “Life a Cosmic Story”, “Space Junk” IMAX movie, visualizations with Denver Museum of Science and Industry, Adler Planetarium, and recent tests from “Solar Superstorms”.